Privacy and security are a major focus for business laptops. An in-built privacy filter like HP's SureView displays for its EliteBooks is very important for customers who work with sensitive information. To counter HP, Lenovo has introduced its very own in-built privacy filter for its popular ThinkPad T480s. Security fear remains as one of the defining topics of modern computing. For laptop manufacturers, this can be an opportunity. For example, Lenovo has introduced a camera slide-cover called the "ThinkShutter" for its newest ThinkPad business laptops like the Lenovo ThinkPad T480s or ThinkPad P52. One of its biggest rivals, HP, has introduced a very similar camera shutter on the latest HP EliteBooks. But HP has gone beyond that, as its newest EliteBooks like the HP EliteBook 830 G5 also feature another security feature: HP SureView, an integrated privacy mode for some EliteBook display-panels. For anyone working with sensitive informations, such a feature that narrows the viewing angles can be worth a lot, as keeping information secure when someone sits besides you in a train or plane can be difficult otherwise. Lenovo ThinkPad laptops could not match this feature – until now, since Lenovo has quietly launched a new option for the popular and well-reviewed Lenovo ThinkPad T480s. The newest version of Lenovo's spec-sheet for the ThinkPad T480s includes the new "ThinkPad Privacy Guard" option, which is available on certain models with the lower-end Full-HD (1,920 x 1,080) IPS screen. While the spec-sheet does not reveal much about the functionality of the ThinkPad Privacy Guard, Lenovo has recently uploaded a video on its Youtube-channel that explains it in more detail. In the video, the Lenovo spokesperson explains that ThinkPad Privacy Guard works by darkening the screen and redirecting the light, so that the content is only visible when viewed from the front. Directly referencing HP's SureView system, Lenovo claims that its solution is better, because it preserves battery life and doesn't induce flickering – from our testing, we can indeed confirm that HP's SureView does induces visible flickering when the privacy mode is activated. 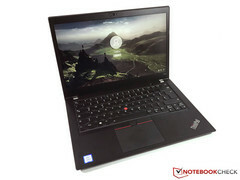 But HP also has advantages: While ThinkPad Privacy Guard is only available on the low-end panel that is not very bright to begin with, the HP SureView displays used in models like the EliteBook 840 G5 are usually extremely bright. Which solution is preferred probably depends on user preferences.